London Hip. New York Paced. California Healthy. The Pendry San Diego. Las Vegas-based Clique Hospitality has exploded onto the San Diego night/daylife scene with the opening of Oxford Social Club, Lionfish Modern Coastal Cuisine and The Pool House within Pendry San Diego. With the highly anticipated opening of the Pendry, San Diego’s Gaslamp District has gained a boutique hotel and 6 unique dining and entertainment venues all in one. Offering boutique hospitality, upscale dining, nightlife and daylife, Pendry San Diego is a lifestyle property that caterers to the appetites of both its hotel customers and neighborhood patrons. The individual venues aren’t tucked away within the hotel, accessible only to those staying at the property; instead the local business, happy hour, tourist and industry clientele alike can easily access all [venues] hassle free. Each feels like its own, independent property. The six individual dining and entertainment venues include Oxford Social Club, Lionfish Modern Coastal Cuisine, The Pool House, Provisional Kitchen, Nason’s Beer Hall and Fifth & Rose. We had the opportunity to chat with Clique Hospitality’s Marketing Scientist, Pearce Cleaveland and learn more about the three venues that Clique Hospitality has designed and developed in conjunction with Pendry. The nightclub, Oxford Social Club is laid out like a living room and is both indulgent and welcoming. With a focus on music, cocktails and service, Oxford Social Club elevates the nightlife experience. Pearce explains that downtown San Diego has been missing a specific type of nightlife venue - somewhere more over the top than a bar, but less production-based than the traditional, fist-pumping nightclub. Oxford Social Club seeks to change the paradigm and offer something fun, funky, eclectic and yet approachable; a place where you can leave it all on the dance floor and enjoy a conversation with friends at the same time. Lionfish Modern Coastal Cuisine is Pendry San Diego’s signature restaurant. Executive Chef Ruiz is well-versed in San Diego cuisine and brings to life seafood-forward dishes like caviar service, sushi and raw bar as well as land options. The restaurant’s atmosphere is a cool, fresh compliment to the coastal menu. Seating 150, the restaurant is bright and airy, with two-floors of warm wood and earth-tones and funky light fixtures. And no meal at Lionfish is complete without the pairing of a hand-crafted, seasonally-focused cocktail(s). 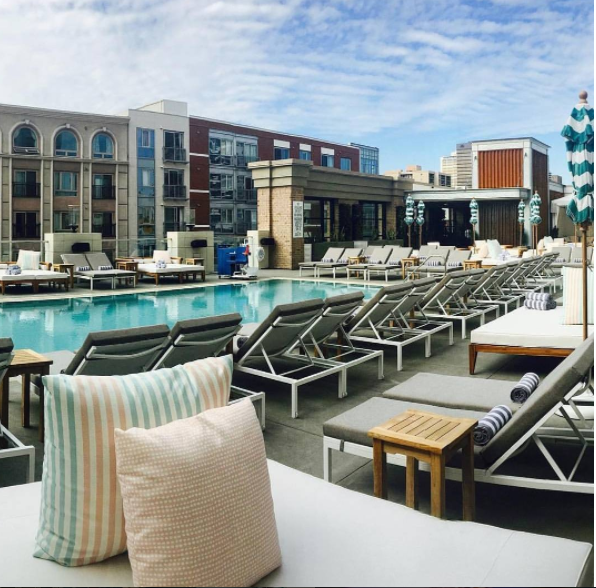 With pool season on the (very near) horizon, The Pool House offers a new, rooftop pool option to tourists and San Diegans alike. Guests are privy to some of the best views in the Gaslamp and can treat themselves to the healthy, light food menu. The cocktail menu goes above your average pool lounge offerings with options like Mules, Mojitos and a considerable wine list. This summer, expect The Pool House to host relaxed daytime and evening events. “It’s been a 2-3 year adventure to build these properties. It’s exciting to see them come to life...people want luxury and service and vibrancy, and it feels like the timing is perfect to bring that and more to downtown San Diego,” continued Pearce Cleaveland. Pendry San Diego is located at 550 J St and 5th Ave. in the heart of the Gaslamp.